Although Rudolf Barshai has made countless recordings - the most important of his current projects is a complete cycle of the fifteen Shostakovich symphonies with the Cologne Radio Orchestra - he always kept aloof from the media circus. Eminently serious, he shuns any form of glitz and glamour, and is not one of the jet-setting conductors that constantly dash round the world performing under-rehearsed programmes. Barshai's name stands for the masterful realisation of the composer's will; a principled advocate of their ideas, he dedicates his legendary ability to rapidly mould an orchestra's sound to his conceptions to one sole purpose: achieving clarity and focus. That extract comes from a 1999 profile of Rudolf Barshai (1924-2010) by Bernd Feuchtner. 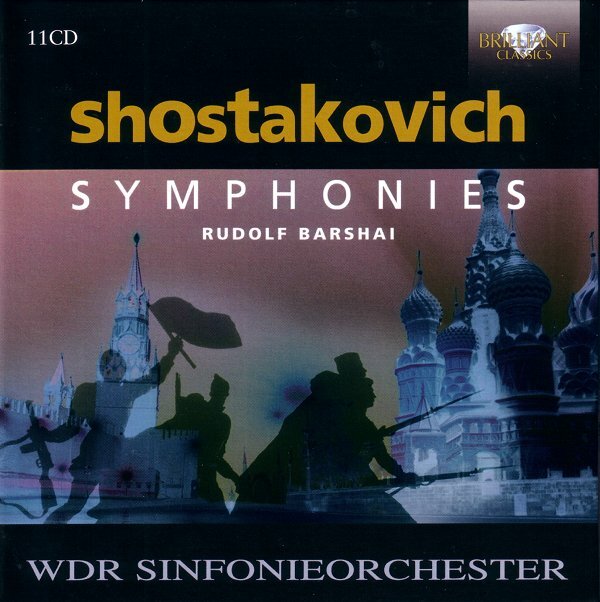 The profile appears in the booklet for the cycle of Shostakovich symphonies Barshai recorded with the Cologne Radio Orchestra (now WDR Sinfonieorchester) between 1992 and 2000 which was released by Brilliant Classics in 2002. Conductor and orchestra may be short on glitz and glamour, but Barshai's Shostakovich cycle is, for me, one of classical music's great overlooked achievements. Holistic is a grossly abused word today, but here we have a genuine example of the whole being greater than the sum of the parts. That is not to say the parts are in any way lacking: Barshai's Shostakovich comes with the composer's blessing, the WDR Sinfonieorchester puts many of its less rehearsed but more glamorous cousins in the shade, and the full-bodied sound from tonmeister Siegfried Spittler, who engineered all fifteen symphonies in the warm acoustic of the Philharmonie Hall, Cologne, is demonstration quality. And the eleven CDs - which are presented in chronological order without splitting any of the symphonies across discs and which come with full programme notes - cost the same as two full-price CDs from more glamorous orchestras and conductors. As a reviewer wrote about another Brilliant Classics box from a low-glitz orchestra and conductor, buy or live in darkness. Also on Facebook and Twitter. No review samples were used in the preparation of this review. Any copyrighted material on these pages is included as "fair use", for the purpose of study, review or critical analysis only, and will be removed at the request of copyright owner(s). If you look at the Wiki entry on the Vancouver Symphony Orchestra, you will find no mention of Rudolf Barshai. Indeed, among the things that are fudged in the Wiki page is the period 1985-1991, during which, it would seem, the orchestra had no music director at all. But in the period 1985-1988 they did: Rudolf Barshai. What a coup! I was equally astounded and excited when his appointment was announced. Barshai was an orchestra-builder, much like Dorati and others, and the VSO, with a lot of veterans who had had it too easy for too long, needed a bit of a shake-up. The first problem to occur was in rehearsals of a work with a prominent solo part for the first violin (concert master). Three times in succession he couldn't get through it, and Barshai fired him. And there were others he thought no longer fit for purpose. But canning the first violin was the beginning of the end. Barshai had supporters in the orchestra, but they were vastly outnumbered by those who put friendship before competence, and who also rebelled against a bit of old-fashioned discipline, which Barshai certainly exercised. Constant rebellion was the order of the day, and thus Barshai was gone in just over two years. He did leave a legacy in the person of a new and very fine concert master, but otherwise he had no chance to work the magic he could have done, no chance to put the VSO on the map, much as he did with the Bournemouth. That audiences greeted many of his performances, notably a Shostakovich Eighth, with ecstasy counted for nothing, notwithstanding that they and the taxpayers of Canada pay for this orchestra. That, I think, is an interesting tale of an opportunity lost, and why with some provincial orchestras, such chances are lost. But if Barshai ever read that Wiki entry he would have found himself written out of history, and that would likely have brought back memories of the bad old days in Moscow. Indeed, I find the complete absence of Barshai from the Orchestra's history a touch creepy. I'd like to think there is an element of shame in this. Thanks for the recommendation. I've been discovering Shostakovich's symphonies in live performances over the last ten years in San Francisco. iI's become some of my favorite orchestral music of all time, and seems to be aging brilliantly. Yes, this is absolutely one of the best cycles, and the Thirteenth is THE greatest performance of that tricky work I've ever heard. Barshai was a great instrumentalist AND became a great conductor with unimpeachable authority (like Rostropovich, less technically adept a baton wielder). Ignorant of the price, but it is at least worth pointing out that Petrenko and the RLPO (Naxos) are dead cheap for individual instalments and just as compelling in very different ways. Not to mention the LSO/Rostropoviches - now there the Eighth is right at the top of the tree.